This article will explore the various types of glues commonly seen and used in the hobby of building wargaming miniatures and provide various tips for using each type. Plastic Glue, also known as Plastic Cement, is used to bond together polystyrene plastic. Polystyrene is used in traditional scale model kits, as well as most kits by Games Workshop. Plastic glue is technically a solvent, rather than an adhesive, as it will slightly dissolve the plastic that it is applied to. When two plastic parts are pressed together, the solvent action will cause the plastic to melt and meld together, effectively welding the two pieces together. As such, this becomes a permanent bond, which cannot be separated short of breaking the plastic to separate parts. Plastic glues come in three general types. The first is a rather thick form that is typically dispensed from a tube. These glues were common many years ago in the scale model hobby, but have lost popularity over the years due to being difficult to apply. They are virtually unknown in the wargaming hobby today. The most common type of glue used today is a medium viscosity liquid that can be dispensed from a bottle with an included fine applicator tip. Finally, less commonly seen in the building of wargaming miniatures, is ultra-thin or liquid glue. This typically comes in a glass bottle with an included brush applicator in the cap. Using each of these types of glues is slightly different. To use the medium viscosity type, apply a small bead of glue with the applicator bottle to the surface to be joined, then join the two parts and hold them together. To use the ultra-thin liquid glue, hold the two parts together and then apply the brush to the join. Capillary action will pull the glue down and into the joint. Plastic glue will begin to bond pieces together almost immediately. The parts should be held together for approximately 30 seconds to allow the bond to begin to set. Larger or heavier parts may need to be held longer, or clamped in place using rubber bands, clothespins, or clamps designed for plastic. The bond will appear set after 20 minutes to an hour, however full drying time is 24 hours. For best results, you should allow the full 24 hours for the glue to cure before using the miniature in a game, or attempting to paint it. Parts that are slightly warped can often be forced into place by clamping the parts together during the curing period. Most often this will be done with larger parts, such as tank hulls. Care should be taken to avoid getting plastic glue on parts that are not being joined. As the glue melts the plastic, it can cause a loss of detail if allowed to contact unintended surfaces. In addition, touching areas that have glue on them will lead to fingerprints being embedded in the plastic. If this happens, simply wait 24 hours and then gently file or sand the area smooth. As a plastic solvent, the glue will have little to no effect on a painted surface. If you are attempting to join parts that have been painted, gently scrape the paint clear from the joint before applying the glue, or use a different adhesive, such as super glue. Plastic glue is typically made from volatile organic compounds and is toxic. The medium viscosity glues are typically made from xylenes and n-butyl acetate, while liquid glues are made from methyl-ethyl-ketone and ethyl acetate. Care should be taken when using plastic glue to both ensure there is adequate ventilation and to avoid excessive skin contact. Glue should never be ingested, and contact with eyes and mucous membranes should be avoided. Plastic glue is flammable. Work in a well-ventilated area and avoid sources of ignition! Super Glue, or cyanoacrylate (or CA), has been commonly used as a household adhesive since the 1970s. Cyanoacrylate was originally discovered in the early 1940s as part of the US war effort, but ultimately wasn’t utilized until being re-discovered in the 1960s. Cyanoacrylates (Super Glue is a trademarked name), are used for many purposes, including bonding skin (as a wound closing agent), and as a forensic tool (CA vapors help reveal latent fingerprints), in addition to their purpose as an adhesive. Super Glue works through a process known as polymerization, whereby the cyanoacrylate monomers quickly form strong polymer bonds in the presence of water. This process begins almost immediately due to the presence of humidity in the atmosphere. Cyanoacrylate will bond together nearly any material, which is what makes it so versatile. For the purposes of modelling, CA glues should be used to bond together non-polystyrene plastics as well as to glue dissimilar materials. Models made from various metals (pewter mixes, and before that, lead) are not uncommon in the wargaming hobby. Some smaller games, such as Infinity by Corvus Belli, continue to exclusively produce metal miniatures, while larger companies such as Games Workshop have mostly moved away from metal. In addition to metal and plastic, the third most commonly seen material is various forms of resin. Reaper’s Bones models, Privateer Press’s Warmachine and Hordes lines, as well as some Games Workshop models are all made in various forms of resin. Similar to Plastic Glue, there are several different forms of Super Glue. Gel-type Super Glue is typically dispensed from small tubes, and resembles a thick gel. It has a long bonding time, allowing time to fit parts together before the glue cures. 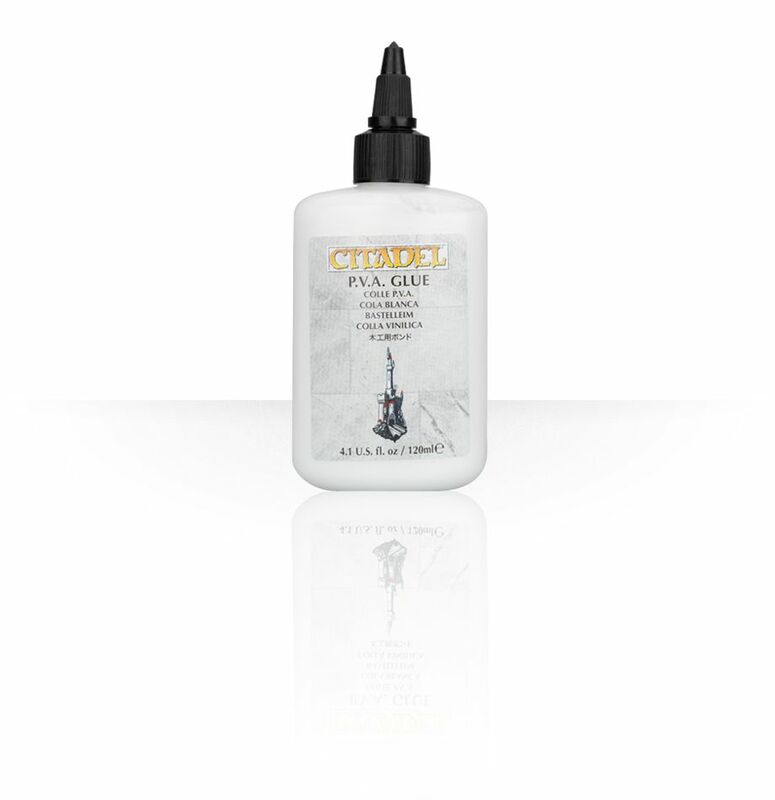 Some gel glues, known as gap-filling super glue, can be used to fill gaps between parts. However, if allowed to fully cure, the result can be very difficult to file and smooth. Thin Super Glues are, as the name suggests, a low-viscosity glue that flows easily. As a result, they have a quick bonding time–as little as a few seconds. Some thin glues are dispensed from a bottle, while others make use of a brush integrated into the cap. Don’t use a paintbrush to apply super glue though, as it will ruin the brush! Super Glue works best when applied thinly. The process of polymerization can cause a microscopic ‘skin’ to form on the surface, isolating lower layers of glue from the water molecules they need to bond. This will result in a dramatically increased cure time, as well as a generally weaker bond over time. Super Glue has a very poor shear strength. A suitable application of force will generally cause the bond to fail and the parts to separate. This can be both a positive and a negative. When separation of parts is actually desired, placing the model in the freezer for a few hours will cause the glue bond to become more brittle and easier to snap apart. The glue will form a stronger bond with rough materials. Joints should be roughed up with a file or sandpaper before attempting to glue them. For larger joints on metal models, scratching a cross-hatch pattern into the metal with a hobby knife will provide a stronger bond. Never use a cyanoacrylate based adhesive to glue clear plastic parts, such as cockpit canopies. The fumes from the curing glue will permanently fog or craze the clear plastic parts. Cyanoacrylate adhesives do not have a very long shelf life due to their interaction with moisture in the air. An unopened bottle of glue will last a year or more. Keeping super glue in the refrigerator or freezer will prolong its life. An opened bottle of super glue can last as little as a month!. Very commonly, excess glue will build up in and on the tip, trapping air in the bottle and preventing the glue from flowing as it slowly hardens. Keeping the tip clean, and storing the glue in the fridge or freezer while not in use should help to prolong its life. Due to the moisture in skin, Super Glue will bond skin together–sometimes nearly instantly. Avoid getting glue on your hands or fingers, and especially keep it away from your mouth and eyes. If you get super glue in your eyes, seek immediate medical attention. For fingers, make use of a cyanoacrylate debonder, or acetone (often found in professional nail polish removers or in the paint section of your local home improvement store). PVA (Polyvinyl acetate) is more commonly known as white glue, wood glue, carpenter’s glue, school glue, or under the brand name Elmer’s Glue. PVA glue is an emulsion of polyvinyl acetate and water, and is usually a milky white color, or yellow in the case of the wood or carpenter’s variety. All PVA glues dry to a rubbery consistency, with a clear or yellowish tint based on the original glue color. PVA does not form a very strong bond on non-porous materials and can usually be easily peeled off when dry. The glue is non-toxic, thus its common use amongst children for school projects. For hobbyists, PVA glue is used for several purposes. It is very commonly used to secure basing materials such as sand and small rocks to figure bases. It can also be used to stick flocking material or static grass to bases and scenery. It can also be used to secure clear plastic parts where something like Super Glue might fog up the plastic. Being a water-based emulsion, PVA can be watered down if necessary. For large applications to scenery pieces, PVA glue can even be applied via a spray applicator. PVA glue will not form a strong bond if the materials being glued are not porous. As such, do not attempt to use PVA glue to bond structural elements of model kits. While PVA glue can be brushed on and cleans up well with water, it is not recommended to use the same brushes for glue as you would use to paint with. Keep a separate brush or brushes to apply glue. When diluting PVA glue for large-scale applications, the addition of a few drops of dish-washing detergent can help to break the surface tension of the water and allow better penetration of the glue into the materials being glued.